Canada’s lone pay-per-view of 2018 has its main event. UFC sources confirmed to TSN that a featherweight title fight between champion Max Holloway and top-ranked, undefeated Brian Ortega will headline UFC 231 at Scotiabank Arena in Toronto on December 8. MMA Junkie had previously reported that the fight was verbally agreed upon for the event. The bout had originally been scheduled as the co-main event for UFC 226, the promotion’s annual International Fight Week card, but Holloway was forced to withdraw during fight week due to an undisclosed health issue. 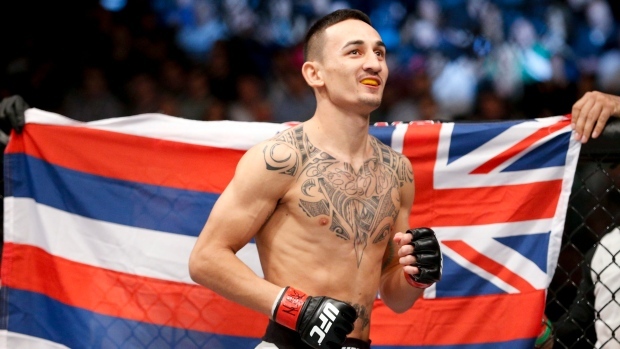 Holloway has won twelve straight fights since losing to Conor McGregor in 2013 and hopes to continue that streak against a surging Ortega, who boasts a 14-0-1 record and defeated former lightweight champion Frankie Edgar in March. This will be the third straight year that Holloway has had a title fight in the UFC’s early December pay-per-view. One of those events was in Toronto, as he captured the interim featherweight title when he defeated Anthony Pettis at Scotiabank Arena in 2016. Holloway is coming off of back-to-back technical knockout victories against Jose Aldo, who is widely considered the best featherweight of all-time. In the first bout, Holloway captured the undisputed title in the main event of UFC 212 on Aldo’s home turf in Rio de Janeiro, Brazil and the second was his first title defence, where he defeated Aldo in the main event of UFC 218 in Detroit. Two other fights have been added to the card, a light heavyweight matchup between two of the best strikers in the division as fifth-ranked Jimi Manuwa faces unranked Thiago Santos. Santos recently defeated Anders in the main event of UFC Fight Night in Sao Paulo, Brazil last month when both made their promotional debuts at light heavyweight. A middleweight bout between Toronto-native Elias Theodorou and the aforementioned Anders has also been added to the card. On multiple occasions, Anders has named Theodorou as an opponent that he had hoped to face in hopes of moving up the middleweight ladder. In addition to these bouts, the card features a matchup between top-ranked women’s flyweight Valentina Shevchenko and former women’s strawweight champion Joanna Jedrzejczyk for the vacant women’s flyweight title, as well as fights involving Canadians Hakeem Dawodu, Chad Laprise, Olivier Aubin-Mercier and recent The Ultimate Fighter winner Brad Katona.